In a world void of many Honeycomb-specific apps, we often turn to small screen variants in order to fulfill our on-the-go needs. While many of the apps designed for phones work and scale appropriately on the large screen, it often to leads to odd placement of objects, tiny buttons to tap, and other inconveniences that end up being less-than-ideal. 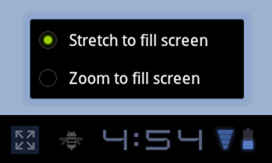 Fortunately, Google incorporated a solution to this problem in Android 3.2 (Honeycomb): "zoom mode." Currently, when you run an app designed for phones on a Honeycomb tablet it stretches everything to fit the screen. With the new "zoom to fill" option, it will instead run the app in MDPI resolution (320*480) and upscale everything - effectively running the app at 200% its original size. Undoubtedly, this will cause some pixelation on the big screen, but it should make most phone apps a bit more usable. As you can see, it looks quite usable. The best part, though, is the fact that you can switch back-and-forth between the two modes, which should come in quite handy. Samsung Galaxy S II Review: Modern And Powerful, But Will Samsung Keep It That Way? [New Game Review] Inotia 3 Gives Us A Great Hack And Slash, But Is It Ruined By Micropayments?